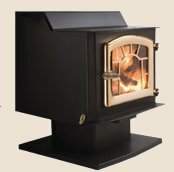 The Kuma Tamarack Pedestal model comes with a live air-tight ash pan system that makes ash removal easy. No need to let the fire die on this design, simply pull out the drawer, dump it outside, replace the drawer and all wood. It comes as a complete stove out of the box with the pedestal ready for outside air and ash pan system standard. Manufactured home approved.